A building's energy performance certificate inform the energy demand of the building (or flat) necessary to meet the needs resulting from its use (expensive energy for heating, water heating, ventilation, air conditioning and lighting). Calculated by the authorized person certificate refers to energy consumption (also called final energy) resulting from the design features of a building (material, thickness, thermal parameters), its geographical location, purpose (the objectives of public, residential), its standard and equipment installations. 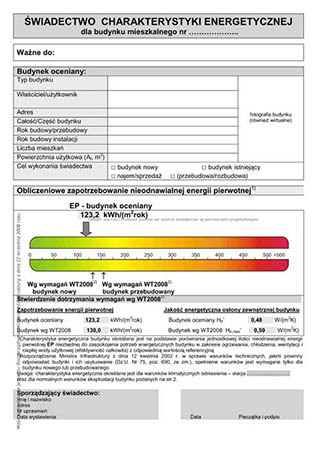 From 1 January 2009, the certificate of the energy performance of buildings (premises) of energy, the energy performance certificate is obligatory for each building to be put to use and the building subject for sale or rent, and also in the case where, as a result of conversion or renovation of the building has changed its energy performance. The obligation to draw up an energy certificate does not apply to buildings (premises), that are not rented to new tenants, sold or were not upgraded. The energy certificate is valid for 10 years from the date of issue. The new certificate must be drawn up after the expiry of the current, or if carried out renovation of the building (apartment) has an impact on its energy characteristics (for example, thermal efficiency improvement, building insulation, windows or heating installations replacement). Upon the sale of the buildings or premises made after January 1, 2009 for use in the notary must be appropriate for the certificate. The owner of the agency real estate Advisor Jarosław Kantor has the necessary permissions to calculate and draw up energy certificates (no registry entry: 5444, no permissions: 7696).